Wall Mounted Oil Condensing Boilers – What are they? How is this extra efficiency achieved? In our wall mounted oil boiler design, additional heat-exchanger capacity has to be created to extract out this additional heat that would normally be lost via the flue gases. As heat is increasingly drawn from the flue gases the greater, in inverse proportion, must be the heat absorption characteristics of the heat exchanger to extract the available heat. Wall Mounted– System Oil Boiler – A system boiler is basically an standard boiler, which includes the pump and expansion tank that are built into the wall mounted condensing oil boiler which allows you to have a “sealed heating system”, which has become the standard over the last 15 years or so. The benefits of a ” sealed system” are that no feed and expansion tank is required in the loft or at high level ( another benefit is that these tanks were prone to freezing or bursting at the most inconvenient time , often cause major water damage or resulting in a failed heating system ), and that the oil heating installation is made a lot more tidier, easier, and simplifies servicing of the wall hung oil boiler, as everything is in one place , withing the boiler casing. Wall Mounted Combination or “Combi” Oil Boiler – A “Combi” or Combination Oil Boiler are the most popular installed oil domestic boilers these days in the UK, as the provide both heat for the central heating system and Domestic Hot Water ( sometimes referred to as DHW) , for washing and bathing within a household.This makes the wall hung oil combi boilers extremely efficient as they only heat the domestic hot water when a shower or hot water tap is turned on, thus ensuring maximum efficiency. They eliminate the need for a domestic hot water cylinder or tank and the space required by it, not to mention the expense and also eliminate the need for a feed and expansion tank in the loft space. These Wall Mounted Combi Oil Boilers, are a complete package , or the complete wall hung oil combi boiler system , in one unit, being simple to use, easy to install and economical to run, with plenty of domestic hot water , for you to enjoy a bath or shower.The Flow rate of these wall mounted oil combi boilers is 12 to 14 Litres a minute, with a 50 Degrees C temperature uplift or rise. Balanced flue boilers can be judged to be more stable in burning conditions as they are less affected by flue draught and wind conditions. Air intake and flue discharge are more or less balanced. Also, balanced flue boilers take air for combustion from outdoors and, therefore, air change within the dwelling (itself a significant cause of heat loss) is reduced.Low level balanced flue wall mounted boilers may only be used with Kerosene. Gas Oil is not permitted. 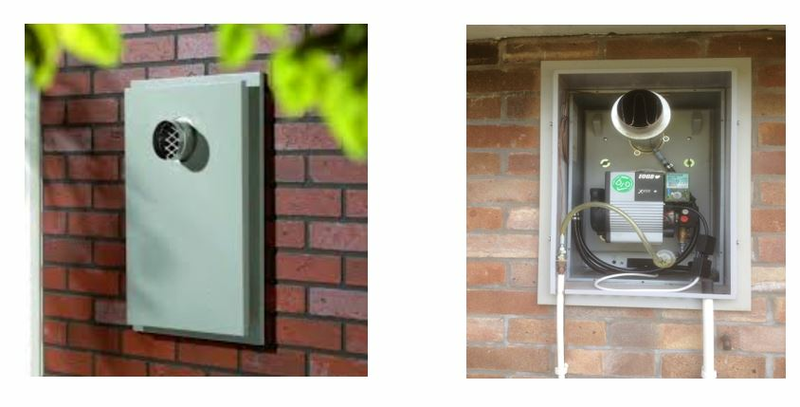 Flue terminals must be protected by a terminal guard which is supplied with our wall mounted oil boilers. Balanced flue oil terminals must be 600mm from any opening door to window. Avoid positioning where flue discharge or noise could cause inconvenience or objection.Avoid narrow alleyways or confined spaces which could cause ingress of flue products, pollution, which could cause malfunction of the boiler. Also take care not to allow contact between the flue and combustible material. These recommendations relate to basic safety requirements and should assist the installer in the siting of the wall hung oil boiler. 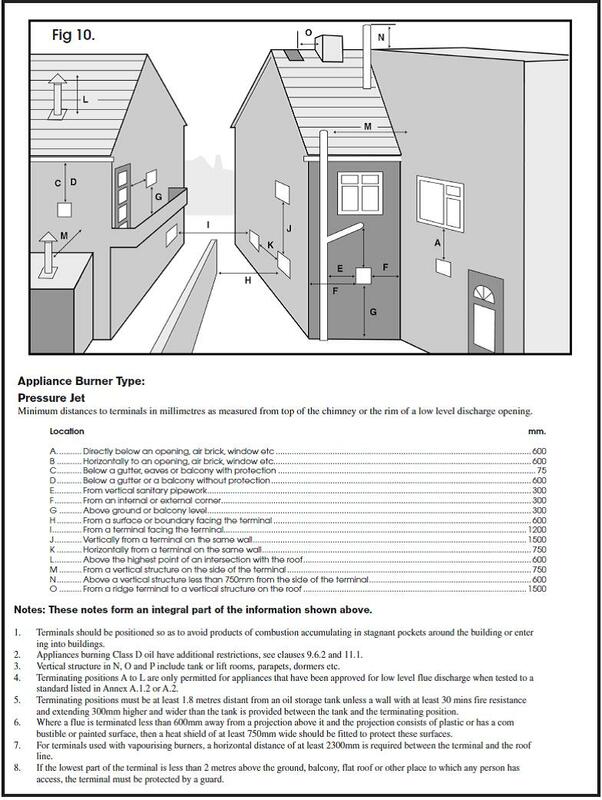 Please see the picture below for the current regulations for the positioning of the flue terminal, for our wall mounted boilers range. When using the Horizontal Balanced flue kit , the air for the combustion of the boiler comes externally into the boiler,and is considered “room sealed” thus no ventilation of that room is required.Our flue’s have been specifically designed to offer the smallest diameter on the market, meaning that they can not only be installed with the minimum of structural damage, but are also ideally suited for installations in listed buildings in which the minimum of structural damage is of maximum importance.Alternatively via the Horizontal offset flue option the flexible flue pipe can be offset in almost any direction , 2 meters from the wall hung oil boiler’s left, centre or right hand side , to achieve the correct flue position , allowing the flue to be situated in a practical and convenient location to suit the site conditions. All of our wall mounted oil boilers have been designed and manufactured to the following standards – OFTEC OFS A100, European Directives BED 92/42 and EEC LVD EN 60335-1 and EMC 89/33C/EEC and are WRAS approved. They are designed to burn Kerosene 28 Class C fuel – to British Standard Specification BS 2869 Part 2 Class C2 , European standard BS EN 2869:2010 Class C2, which are also referred to as Heating Oil, 28 Second Burning Oil or Central Heating Fuel. This grade of Kerosene has clean burning characteristics whilst maintain a high heat output and maximum fuel economy.